I had the Sayers Croft Family Volunteers out yesterday on the top of Pitch Hill. We were carrying on with a task we started earlier in the year, clearing some of the tree re-growth, that if left, will eventually obscure the view. Unfortunately our lowest turnout, only 3! But a great effort and still managed to get a fair bit done. I’m inviting anyone who’d like to come along and help out to our next planned morning on 19th December on Holmbury Hill. There’s a small patch of heather in the Disabled Access Track that needs to be weeded and cleared, and hopefully if enough people come we can also start to tackle some of the weeds in the top pond. You don’t have to be a Friend of the Hurtwood, anyone is welcome even if you can only stop for an hour or so. Please bring secateurs, loppers and gloves. We will supply hot drinks, and possibly a mince pie or two! Meet at No. 1 car park 10 am. The new final section of BKB has been completed, and is now open. Please respect the new fragile surface! 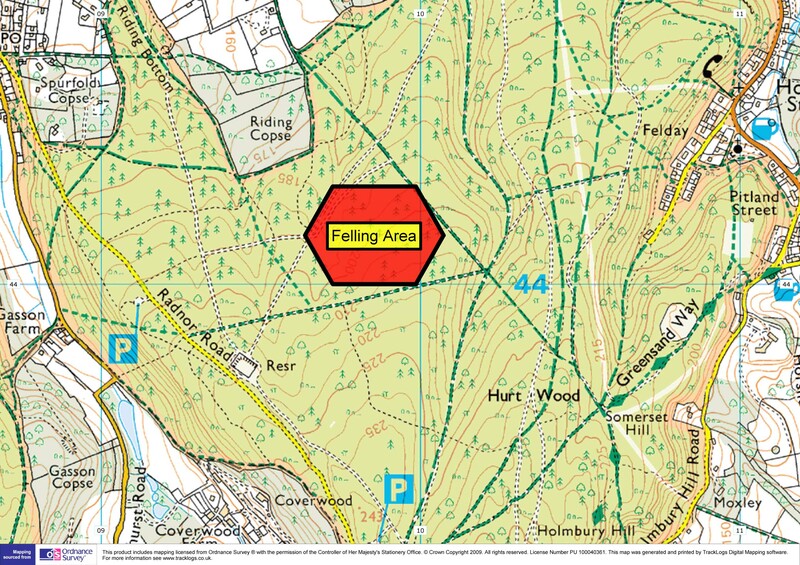 Felling work has now started on Holmbury Hill, the attached map shows the current working area. Signs have been erected to show the area as well. Please, for your own safety, keep at least 100 metres from any machinery. Please also note, due to the recent bad weather, the planned closure of No.9 car park, will not be happening for the moment. The main groundwork has now been finished, but work to the surface, to make it durable, will be ongoing throughout November. If the weather is favourable, we aim to have it open by the beginning of December.